For investors who don’t rely much on historical research, evidence, or memory, the exuberance of the market here is undoubtedly enticing, while a strongly defensive position might seem unbearably at odds with prevailing conditions. For investors who do rely on historical research, evidence, and memory, prevailing conditions offer little choice but to maintain a strongly defensive position. Moreover, the evidence is so strong and familiar from a historical perspective that a defensive position should be fairly comfortable despite the near-term enthusiasm of investors. There are few times in history when the S&P 500 has been within 1% or less of its upper Bollinger band (two standard deviations above the 20-period moving average) on daily, weekly and monthly resolutions; coupled with a Shiller P/E in excess of 18 – the present multiple is actually 22.3; coupled with advisory bullishness above 47% and bearishness below 27% - the actual figures are 51% and 24.5% respectively; with the S&P 500 at a 4-year high and more than 8% above its 52-week moving average; and coupled, for good measure, with decelerating market internals, so that the advance-decline line at least deteriorated relative to its 13-week moving average compared with 6-months prior, or actually broke that average during the preceding month. This set of conditions is observationally equivalent to a variety of other extreme syndromes of overvalued, overbought, overbullish conditions that we've reported over time. Once that syndrome becomes extreme - as it has here - and you get any sort of meaningful "divergence" (rising interest rates, deteriorating internals, etc), the result is a virtual Who's Who of awful times to invest. Consider the chronicle of these instances in recent decades: August and December 1972, shortly before a bull market peak that would see the S&P 500 lose half of its value over the next two years; August 1987, just before the market lost a third of its value over the next 20 weeks; April and July 1998, which would see the market lose 20% within a few months; a minor instance in July 1999 which would see the market lose just over 10% over the next 12 weeks, and following a recovery, another instance in March 2000 that would be followed by a collapse of more than 50% into 2002; April and July 2007, which would be followed by a collapse of more than 50% in the S&P 500, and today. The prior instances were sometimes followed by immediate market losses, and were sometimes characterized by extended top formations - which produce a sort of complacency as investors say “see, the market may be elevated and investors may be over-bullish, but the market is so resilient that it’s ignoring all that, so there’s no reason to worry.” Ultimately, however, the subsequent plunges wiped out far more return than investors achieved by remaining invested once conditions became so extreme. We are in familiar territory, but that territory generally marks the mouth of a vortex. Based on ensemble methods that capture a century of evidence – from Depression-era data, through the New Deal, World War, the Great Society, the electronics boom, the energy crisis, stagflation, the great moderation, the dot-com bubble, the tech crash, the housing bubble, the credit crisis, and even the more recent period of massive central bank interventions – our estimates of prospective market return/risk have been negative since April 2010 and have remained negative even as new data has arrived. Since early March, those estimates have plunged into the most negative 0.5% of historical instances. It’s worth noting that the S&P 500 posted a negative total return between April 2010 and November of last year. Of course, the market has also enjoyed a risk-on mode since then. Through Friday, the S&P 500 has achieved a total return of nearly 25% since our return/risk estimates turned negative in early 2010. Defensiveness has clearly been taxing in that respect. But this doesn’t remove the question of whether the market’s recent gains are durable, much less whether they will be extended. Corporate insiders certainly don’t seem to think so – their sales have tripled since July, to a rate of six shares sold for each share purchased. Far from being some novel “new era” environment, present conditions – rich valuations, overbought trends, lopsided bullishness, heavy insider sales, and lagging market internals – are part of a historical syndrome that is very familiar in the sense that we’ve repeatedly seen it prior to the worst market declines on record. But as the chronicle above should make clear, this doesn’t make our short-term experience any easier, because these conditions can emerge, go dormant for a few months while the market retreats modestly, and then reappear as the market registers a marginal new high. The ultimate outcome has historically been spectacularly bad, but it still takes patience and discipline to stay on the sidelines during late-stage, high-risk advances. Of course, the present instance may turn out differently than every prior instance has – it’s just that we have no basis to expect that outcome. The most interesting feature of last week’s “decision” by the European Central Bank was the continued eagerness of investors to hear what they want to hear, rather than what is actually said. With little doubt, what investors think they heard was that the ECB has finally decided to launch a new program by which it will begin purchasing Italian and Spanish debt in unlimited – unlimited – amounts, putting an emphatic end to European debt strains, and decisively ensuring the future unity of the Euro. If you wondered why Angela Merkel and the whole of Germany was not immediately up in arms, it is because prior to transactions by the ECB, the receiving country would have to submit to an adjustment program, ideally involving the IMF. This is nothing like what Spain has been asking for, which is for the ECB to make unconditional purchases. To benefit from the proposed OMT program, these countries have to subordinate their fiscal policy to outside conditionality. But assuming these countries accept the adjustment programs, at least they can be assured that the ECB will buy their debt in unlimited amounts, can’t they? Read carefully – the ECB did not promise “unlimited” financing. Rather, it refused to specify an amount in advance (ex-ante), because it doesn’t want the markets to look at some inadequately small and fixed number and begin to speculate against the ECB as soon as that particular number is approached. By refusing to set a specific amount in advance, Draghi said in his press conference that he wanted the policy to be perceived as fully effective. But perception substitutes for reality only for so long. If Merkel, Monti and Rajoy were stranded on a mountaintop and Merkel was the only one with a bag of muesli, she might offer some to the other two without specifying an amount in advance, but there’s no doubt she’d be slapping it out of their hands if things got out of control. This last provision is likely to both calm Germans and inflame them. Sterilization means that for every euro of Spanish or Italian bonds the ECB buys (creating new euros in the process), it will drain euros by selling some other security – most likely bonds of Germany, Holland, Finland, or other stronger European nations. This will help to calm Germans because it indicates that the overall supply of euros will not expand. It will also inflame them, however, because the existing stock of euros will now have been created to provide fiscal support to Spain, Italy and other troubled countries, while Germany, Holland, Finland and stronger countries will not have benefited at all from the money creation. It will be interesting how this plays on September 12, when the German Constitutional Court is set to decide on the legality of the European bailout funds, the EFSF and the ESM (technically, the Court will rule on an injunction against even passing it into law, but will not formally rule on constitutionality until possibly next year). My expectation is that they will rule that these mechanisms are in fact allowable and consistent with the German Constitution. Where it gets interesting is whether they will rule that it is allowable to leverage these mechanisms or operate with a banking license (which would make Germany’s existing contribution “capital” that could be wiped out, leaving Germany on the hook for much, much larger amounts - which essentially cedes fiscal authority from the German people to the ESM). I suspect that there is a fair chance that the Court will add language in their ruling to reject that possibility, which may force the idea of a “big bazooka” back to square one. We’ll see. Here in the U.S., Friday’s August employment report was surprisingly weak relative to Wall Street’s expectations, though hundreds of thousands of workers abandoned the labor force, which allowed the unemployment rate to decline. Relative to our own expectations, the figure was elevated, as I expect that the August employment figure will ultimately be revised to a negative reading. This would be consistent with revisions that we’ve seen around prior recession starting points. For example, if you look at the originally reported data for May through August 1990, you’ll see 480,000 total jobs created (see the October 1990 vintage in Archival Federal Reserve Economic Data). But if you look at the revised data as it stands today, you’ll see a loss of 81,000 jobs for the same period. Look at January through April 2001, at the start of that recession. The vintage data shows a total gain of 105,000 jobs during those months, while the revised data now shows a loss of 262,000 jobs. Fast forward to February through May 2008, and though you’ll actually see an originally-reported job loss during that period of 248,000 jobs, the revised figures are still dismal in comparison, now reported at a loss of 577,000 jobs for the same period. As other good economic analysts have recognized, economic time series tend to be revised after-the-fact, with upward revisions in periods just before the recession begins, and downward revisions in periods just after the recession begins. I continue to believe that the U.S. joined an unfolding global recession, most probably in June of this year. There is strong evidence to suggest that this is little but false comfort. While we don’t expect material inflationary pressures until the back-half of this decade, the Federal Reserve has increasingly placed itself into a position that will be nearly impossible to disgorge without enormous disruption. Specifically, the U.S. economy could not achieve a non-inflationary increase in Treasury bill yields to even 2% without requiring a nearly 50% reduction in the Federal Reserve’s balance sheet. This point is easily demonstrated in data from 1947 to the present. The relationship between short-term interest rates and the amount of monetary base per dollar of nominal GDP is very robust, and is widely recognized as the “liquidity preference” curve. We are already way out on the flat part of this curve. Note that Treasury bill yields have never been at even 2% except when there was less than 10 cents of base money per dollar of nominal GDP. There are only 3 ways to get there from the current 18 cents – dramatically cut the balance sheet, keep interest rates near zero for the next decade (assuming nominal GDP growth of 5% annually), or accept much higher rates of inflation than most would consider acceptable. Moreover, with a portfolio duration that we now estimate at about 8 years, historically low yields on Treasury securities, and a Fed balance sheet currently leveraged about 53-to-1 against the Fed’s own capital, an increase in long-term yields of anything more than 20 basis points a year would produce capital losses sufficient to wipe out interest income, making the Fed effectively insolvent, and turning monetary policy into fiscal policy. On the subject of Fed leverage, it is one thing to purchase long-dated bonds when yields are high. It is another to purchase them when yields are at record lows and very small yield changes are capable of wiping out all interest income and leaving the Fed in a loss position when it is already levered 53-to-1 (2.9 trillion of assets on 54.6 billion of capital, according to the Fed’s consolidated balance sheet). At a 10-year Treasury yield of just 1.6% and a portfolio duration of about 8 years (meaning that a 100 basis point move causes a change of about 8% in the value of the securities held by the Fed), it takes an interest rate increase of only about 20 basis points (1.6/8) to wipe out a year of interest on the portfolio held by the Fed and push it into capital losses. It would then take another 24 basis points to wipe out all of the capital on the Fed’s balance sheet. Of course, they don’t mark the balance sheet to market. So the public might not be aware of those losses, but that would only mean that we would have an insolvent Fed printing money on an extra-Constitutional basis to fund its own balance sheet losses instead of public spending. Based on a report from UBS (h/t ZeroHedge), the Federal Reserve now holds all but $650 billion of outstanding 10-30 year Treasury securities, with UBS warning “a large, fixed size QE program could cause liquidity to tank”, with a similar outcome in the event that the Fed pursues mortgage-backed securities instead. A couple of years ago, Bernanke asserted in a 60 minutes interview that “We could raise interest rates in 15 minutes if we have to. So there is really no problem in raising interest rates, tightening monetary policy, slowing the economy, reducing inflation, at the appropriate time.” Really? Tell that to Paul Volcker, who had to deal with enormous inflation at unemployment rates even higher and a monetary base dramatically smaller than we observe at present. The Fed now holds virtually no Treasury debt of maturity of less than 3 years, as Operation Twist and other efforts have been designed to force investors to choke on short-dated paper yielding next to nothing, in hopes of forcing them into riskier securities. 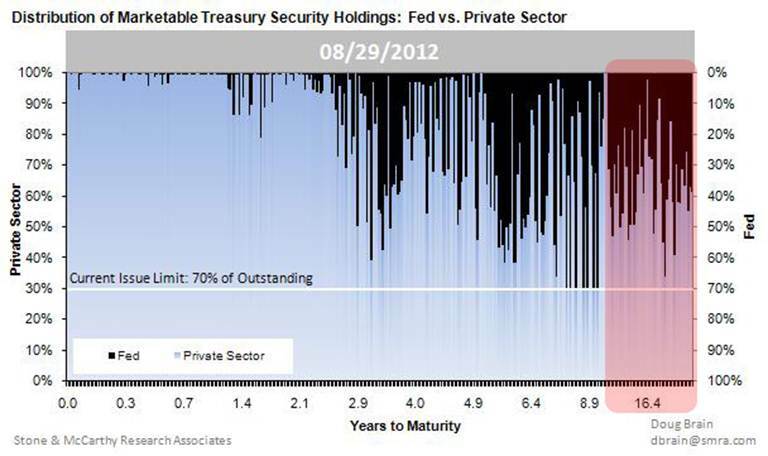 The chart below shows the distribution of Fed holdings (dark bars) versus private sector holdings of Treasury debt, at various maturities. Of course, in equilibrium, someone still has to hold the short-dated Treasury securities, in addition to about $2.7 trillion in zero-interest cash and bank reserves, until those securities, currency, and reserves are retired. To believe that an unwinding of the Fed’s present balance sheet would not be disruptive is full-metal make-believe. Good economic policy acts to relieve some binding constraint on the economy. How does the Fed argue that base money is a binding constraint? At present, there are trillions of dollars held as idle reserves on bank balance sheets. While a “portfolio balance” perspective may well suggest that additional zero-interest reserves will force more investors into risky assets at the margin (which has been most effective after significant market declines over the prior 6-month period), so what? There is no historical evidence that changes in stock market value have a significant effect on GDP. Indeed, a 1% change in stock market value is associated with a change of only 0.03-0.05% in GDP, largely because individuals consume off of their expectation of “permanent income”, not off of transitory changes in volatile securities. If the decline in velocity exactly offsets the increase in base money, inflation is not going to explode overnight. But this happy outcome is brought to you by the passive response of short-term interest rates and the willingness of the public to accumulate zero-interest assets, which is in turn the result of strong and legitimate concerns about credit risk, default risk, and economic weakness. But remove any of those factors, or allow any other exogenous upward pressure on short-term interest rates, and the result will be upward pressure on velocity. Barring enormous rates of real GDP growth, the only way to counter that, as the first chart suggests, will be through either massive (and potentially disruptive) contraction of the Federal Reserve’s balance sheet, or acceptance of undesirable rates of inflation. As hedge funds often discover, and JP Morgan recently learned, it is very easy to get into a position that later turns out to be nearly impossible to exit smoothly. A significant reduction in the Fed’s balance sheet is unlikely to be achieved at long-term interest rates nearly where they are now, which implies capital losses on the Fed account, which implies that in contemplating a further round of quantitative easing, the Federal Reserve is effectively contemplating a fiscal policy action. Unfortunately, they’re likely to do it anyway. From an investment perspective, it’s important to consider the potential effect of additional quantitative easing. As I noted several weeks ago (see What if the Fed Throws a QE3 and Nobody Comes? ), the effect of prior rounds of quantitative easing both in the U.S. and abroad has generally been limited to little more than a recovery of the loss that the stock market sustained over the prior 6-month period. Presently, the S&P 500 is at a 4-year high, valuations are rich on the basis of normalized earnings, and advisory sentiment exceeds 50% bulls – over twice the number of bearish advisors according to Investors Intelligence. In recent years, each round of QE emerged closely on the heels of a significant market loss that produced a spike in risk premiums. In that environment, expanding the stock of zero-interest rate assets had the effect of bringing those risk premiums back down to those observed over the prior 6-months or so, and more recent interventions have shown diminishing returns. At present, risk-premiums are already depressed and there is no 6-month loss to recover. In short, even the evidence of the past several years does not support the automatic assumption that stock prices will advance in the event of another round of QE at present levels. With little doubt, the market is likely to enjoy some immediate cheer from that sort of move, particularly if the Fed refrains from providing a specific ex-ante limit on its purchases - allowing investors to rejoice in the perception that the Fed had launched “unlimited” QE. Still, that cheer may be short-lived. If we examine the way that QE actually operates, and how and why risk premiums have responded to prior rounds, it is entirely unclear that a further round will have much effect beyond an initial spike of enthusiasm. That is, unless one adopts a superstitious faith that stocks will rise in response to QE, since QE makes stocks rise, because QE equals stocks rising, with no further analysis needed. As of Friday, our estimates of prospective return/risk in the stock market remain in the most negative 0.5% of historical instances. Notably, the S&P 500 is within 1% of its upper Bollinger band (two standard deviations above its 20-period moving average) on daily, weekly and monthly resolutions. According to Investors Intelligence, bullish advisors outnumber bearish advisors by more than two-to-one (51% vs. 24.5% respectively), and corporate insiders are selling stock at a pace of six shares sold for every share purchased. On the valuation front, profit margins remain elevated and the ratio of corporate profits to GDP is nearly 70% above its historical norm, and as a result, price/earnings multiples that are based on near-term earnings estimates are elevated, but do not seem extreme. But stocks are not a claim on one year of earnings – they are a claim on a very long-term stream of cash flows that will actually be delivered to investors over time. On the basis of normalized earnings and following our standard valuation methodology (see below), we estimate a 10-year prospective total return for the S&P 500 of less than 4.5% nominal. The Shiller P/E (S&P 500 divided by the 10-year average of inflation-adjusted earnings) is presently 22.3, which is in the richest 5% of all historical data prior to the late-1990’s bubble. While this multiple may not seem extreme relative to the data of the past 13 years or so, it should be remembered that stocks have lagged Treasury bill yields during this period, and the market has experienced two separate plunges in excess of 50% each, precisely because valuations have been so rich. The market conditions we observe at present are very familiar from the standpoint of historical data, matching those that have appeared prior to the most violent market declines on record (e.g. 1973-74, 1987, 2000-2002, 2007-2009). That is no assurance that market losses will be swift, as some of those instances included extended tops characterized by some amount of “churn” and exhaustion before failing. Indeed, even the historical record of these instances is not an assurance that stocks will decline at all in the present case. It’s just that we have no other basis to form expectations about prospective return and risk except to understand how valuations, market action, sentiment and other factors have converged to drive market returns over history. In any event, we are creatures of discipline, and I strongly believe that our discipline is well-suited to achieve our investment objectives over the complete bull-bear market cycle, despite what will inevitably include shorter-term frustrations. Meanwhile, long-time readers of these weekly comments may be somewhat relieved that going forward, I’ll simply refer to our 2012 Annual Report to elaborate on why the recent cycle has been an outlier, compared with the full-cycle performance that we achieved prior to 2009, and that I expect in future cycles. There will be periods where a few of our large holdings get hit (as we saw on Friday) despite the fact that our stock selection has strongly outperformed the S&P 500 over time. There will be periods where we are defensive in an advancing market because we face familiar sets of market conditions that have been devastating for investors, as we do now. But what matters to our strategy, and what produces strong risk-adjusted returns over the complete market cycle, is the habit of accepting greater risk in conditions where risk has generally been well-rewarded, and avoiding risk in conditions where risk has generally been punished. We are now in a very familiar environment that has regularly punished risk-taking severely, if not immediately. Strategic Growth remains fully hedged, with just over 1% of assets invested in additional option time premium to raise the strike prices of the put option side of our hedge, looking out to the end of the year. Strategic International remains fully hedged. Strategic Dividend Value remains hedged at 50% of the value of its stock holdings – its most defensive position. In Strategic Total Return, we used recent bond market strength to cut our portfolio duration to 1.4 years (meaning that a 100 basis point change in interest rates would be expected to affect the portfolio by about 1.4% on the basis of bond price changes), and we cut our exposure in precious metals shares to about 6% of assets, as the prospect for open monetary spigots is likely to be far more limited than investors seem to expect, and global economic activity is slowing rapidly, now including China and other presumed economic bulwarks. Our return/risk estimates remain positive in that sector, but have become much more muted in response to the recent price advance and other factors. The Fund continues to hold small allocations in utility shares and foreign currencies.